We’re excited to announce another new avenue for our expanding outreach programs – Minneapolis Community Education has accepted ARC’s Help, I’m Going Vegan! workshop into its community education catalog. The workshop will be held in four sessions starting Monday, October 7 through Monday October 28 from 6:30-8:00pm at Southwest High School in Minneapolis. Many thanks to ARC volunteer Melissa Maaske for persevering through the application and interview process to get the workshop approved. Come to a fun, family-friendly show featuring live music, vegan food, outdoor activities, and more at the Wood Lake Nature Center Amphitheater at 6710 Lake Shore Drive in Richfield from 5-8pm on Saturday, August 31. Music starts at 6. 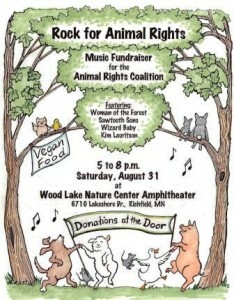 This is a fundraiser to help animals by supporting the life-saving campaigns of the Animal Rights Coalition. Donations will be accepted at entry. In case of rain, we have a back-up room inside. Thanks to everyone who joined us in standing up for elephants at the Minnesota Renaissance Festival on Saturday, August 24. We passed out tons of fliers, educated attendees about why elephant rides are no fun for the elephants, and got lots of supportive honks from passing motorists who saw our signs. ARC has learned from Animal Defenders International that the supplier for the elephant rides is Trunks & Humps. During one of the most disturbing video clips in “No Fun for Elephants,” handler Mike Swain beats an elephant named Krissy, viciously drags her to the ground with a hook, and then kicks her in the face. Krissy is “owned” by Trunks & Humps, run by Bill Swain, Mike Swain’s father. 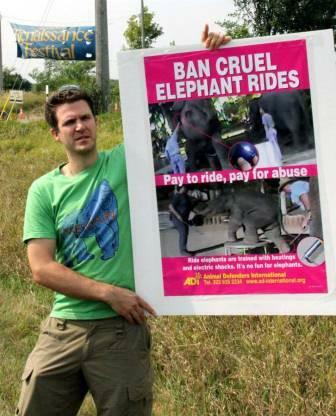 The Bristol Renaissance Fair in Wisconsin chose not to have elephant rides this year. Let’s get Minnesota to follow suit. Please send a polite message to the Ren Fest asking them to make it their policy not to have performing elephants. ARC’s Summer Interns are the Best! We’re thrilled to have Eli Robiner and Gwen Austin as our summer interns this year. 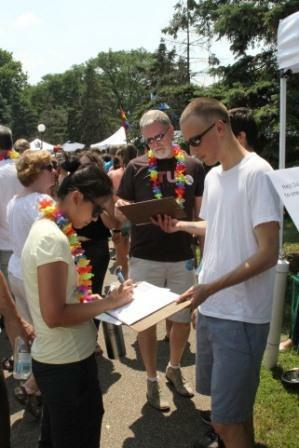 Eli is a student at Carleton College and Gwen is at University of Minnesota-Duluth. Eli is a senior sociology and anthropology major. He decided to intern with ARC this summer to begin learning the ropes of animal rights activism and immersing himself in the Twin Cities animal rights and vegan community. In addition to his work with ARC, he co-founded a vegan advocacy group, Carleton Vegans, Allies, and Questioning, on his campus this past year. He looks forward to a summer of events, delicious vegan food, and (hopefully) liberation for all! Gwen is a junior seeking her bachelor’s degree in Women, Gender and Sexuality as well as a minor in Environment and Sustainability. She is the founder and president of the Animal Rights Club, a student group on her campus, and has been a dedicated supporter of animal rights all her life. Gwen first began volunteering at ARC when she was 17 and is now back as a summer intern. 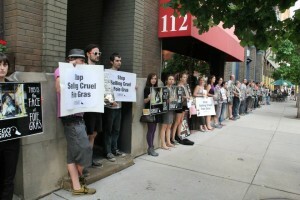 She hopes to strengthen her skills as an activist so that she can someday be a leader in the animal abolition movement. 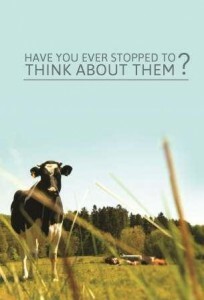 We’re excited to show you our brand new brochure Have You Ever Stopped to Think About Them, designed to make our message of justice for animals accessible to even more people. A recent study by the Humane Research Council looked at several of the most commonly used pieces of animal advocacy literature from large groups and discovered that they were all written at a level only accessible to people with a literacy rate of 11th grade or higher. But according to the U.S. Department of Education, only about 15% of our population reads and comprehends at that level. ARC set out to create a brochure that would lay out the case for animal equality in very simple terms so that more people in our communities could receive our message in a way that works for them. We were able to get the brochure’s text down to a 7th grade reading level, creating a tool that will allow our message to be more accessible to more people. Going forward, we’re hoping to translate the brochure into Spanish, Somali, and Hmong. It was impossible to fit everyone into one shot, but we tried. Thanks to everyone who came out for the rally. Foie gras is produced by plunging a feeding tube down the throats of ducks and geese. This force feeding causes a bird’s liver to swell up to 12X its normal size and leads to enormous suffering. 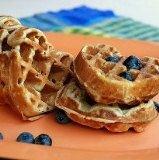 Annual Vegan Waffle Party a Big Success! 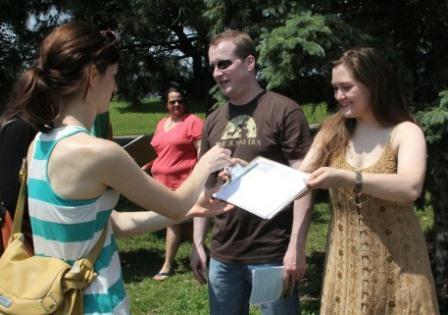 Thanks to Sarahjane and all her kitchen helpers for making the Fourth Annual Global Vegan Waffle Party on Saturday, May 25 at Fuller Park in Minneapolis a huge success. Each year, the waffle party allows us to begin conversations about where our food comes from and the effects of our food choices. This year, the theme of the event was connection: the connection between veganism and protecting animals and the environment, and the building of connections with other members of our community. 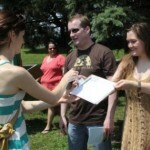 Over 100 people participated and we were thrilled to see all the new people interested in learning more about veganism. Thanks also to LUV NICE CREAM for sampling their new vegan ice cream and donating a percentage of the sales to ARC. The ice cream has no added sugar, and it’s also gluten free and soy free. See photos from the waffle party and vegan ice cream sampling. Thanks to everyone who joined us for the World Laboratory Animal Liberation Week protest at WuXi AppTec on Friday, April 26 from 11:00am to 2:00pm at 2540 Executive Drive in Mendota Heights. With nine facilities in China and six in the U.S., this Chinese company tortures hundreds of thosands of dogs, cats, primates, rabbits, guinea pigs, and other species of animal annually.